Our weather has been so absolutely beautiful these past weeks, intermingled with Easter holiday … much time was spent in the Great Outdoors!! I hope everyone enjoyed their holiday weekend, and maybe even some good spring sunshine as well! The flower beds are tidied up and ready to show off their budding glory, but alas the rain has returned. 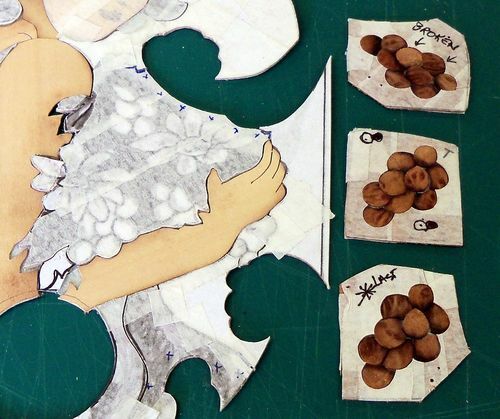 And so … it’s time to continue on with this Marquetry series! I’m sure you all remember how many adorable little grapes were sand-shaded and put back into their clusters! I now have 12 clusters to work with. For sure, 6 of them will be used for the other 3 panels of the wine box … most likely 2 or 3 clusters will be worked into Nouveau Gal’s bouquet … leaving the extras to be used (should I desire) on the lid. Relieved that these little gems are ready whenever I am, I can now put them aside, because I want to play with some part of the design that is less involved. A change of pace is as good as a rest … time for ‘dress making’!! Because the background veneer of Brazilian Rosewood is dark, I don’t want the dress dark as well. The window method allows me to view quite easily what will look best … and clearly the lightest section of this Walnut Burl (inside the window area) is too dark for use. 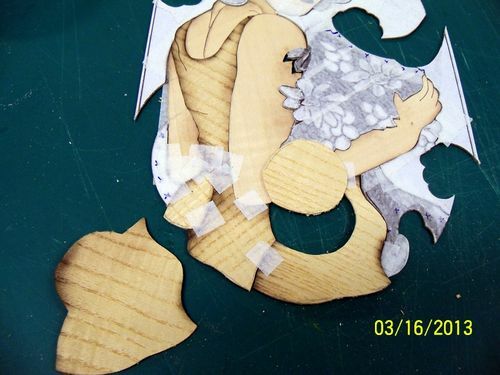 Onto the next veneer … and the next … until I find exactly what I want to use for Nouveau Gal’s dress. Remember that I’m also trying to adhere to the same veneer thickness … or as close as possible, not wanting to scrape and sand my little heart out after the fact! I have LOTS of different veneers, but not as many to choose from when it comes to the slightly thicker ones. Even when I found the ‘dress veneer’ ... I hesitated a bit because Quilted Ash is not exactly fun to work with. 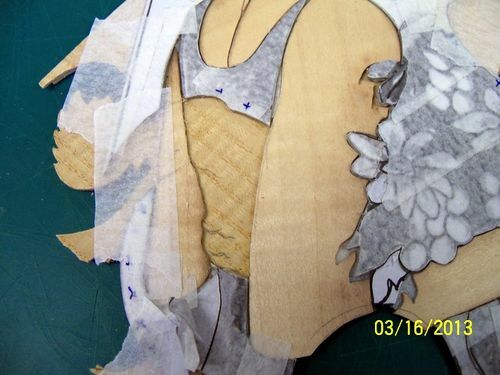 But I kept coming back to that same veneer because the quilted pattern seemed so perfect for the dress. I know it doesn’t look like much at the moment, but just be patient and you’ll see what happens!! just to add some confusion!! Actually, I have to continually remind myself that there is a motif that is also part of this front design. Both top and bottom motif will come into play … but not right at this moment because I’m not ready yet to deal with it. I just want to know the general layout of the motif. I’m afraid you’ll probably have to wait much longer to visualize the layout more clearly. I just stuck this part in for those of you who wish to be as constantly aware as I have to be!! Because I’m a woman, and I have the prerogative to change my mind :) … the original idea of using the second face to create a wine coaster, has radically changed. 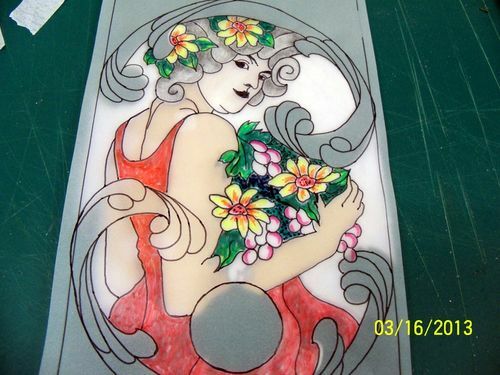 This second one, (entitled) ”Nouveau Lady” will become a complete picture … a gift for our beautiful granddaughter Abby upon her 13th birthday in June!! 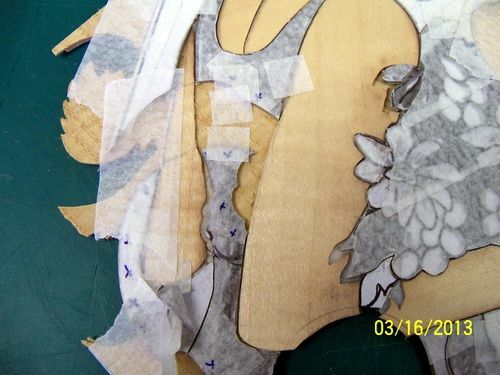 With that desire in mind, comes the manner in which all pieces of the front design will be cut from now on. Apart from the two faces and body parts already completed, I’ll cut two of everything. And … except for the wine spigot hole … all pieces will remain completely whole. 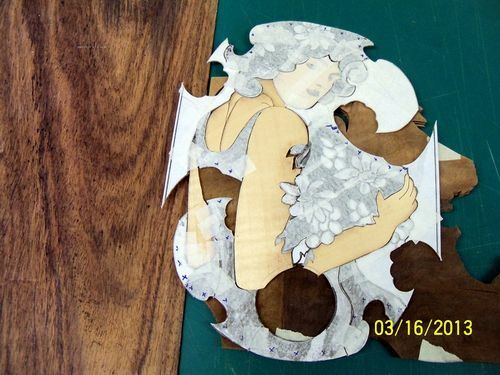 Therefore giving concrete reason why the motif will be cut into my Nouveau Gal at a later date. OKAY … let’s get this gal dressed for the occasion!! The reason behind stating that Quilted Ash isn’t fun to work with is because of the hard and soft nature of its grain. I find it hard to stick to my cutting line when the scroll saw is in constant quandary over speed! Zipping through the soft grain like butter, then grabbing back against the harder grain. 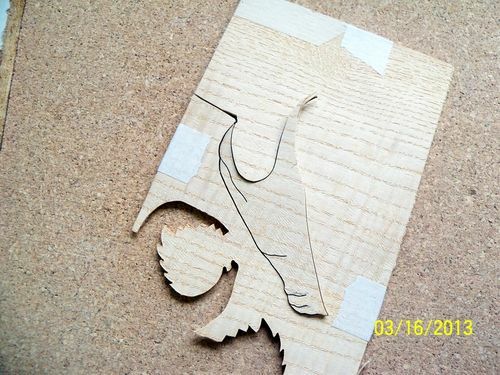 Better to cut with scroll saw than by hand though!! 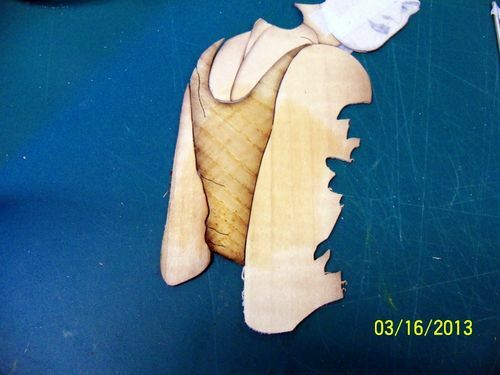 So with the back of her dress cut out, complete with accent lines (to be filled later) ... it’s time for sand-shading. 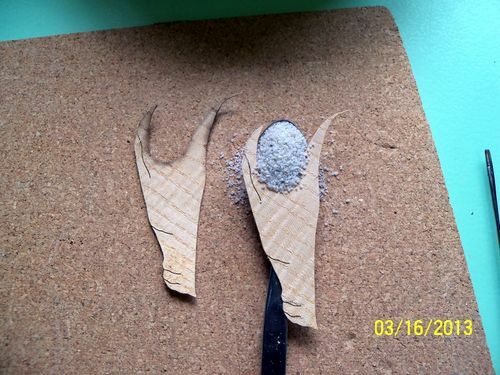 It was easier to set this spoon of mounded silica sand down on my work table so I could photograph the method necessary for shading such an extreme curve. Holding the spoon above the hotplate of sand, the curved section is driven into the mound … then more hot sand is scooped onto the spoon in readiness, repeatedly until the desired shading occurs. The softer parts of Quilted Ash burn more quickly than the harder grain. Another reason I hesitated using this veneer. But sometimes it’s really worth it to put up with a few pesky veneer traits!! And the quirkiness of this interwoven grain pattern does have an upside … very little shrinkage occurs from sand-shading! I’ve set the sand shaded portion into ”Nouveau Lady”, and applied a bit of lacquer thinner to both dress and arm veneers so you can see that when finish is (eventually) applied, there will be a good distinction (colour-wise) between the two. I like how the quilted grains pop out!! These next two photos explain better the cutting arrangement … spigot hole cut from one of the two veneers for that particular section. 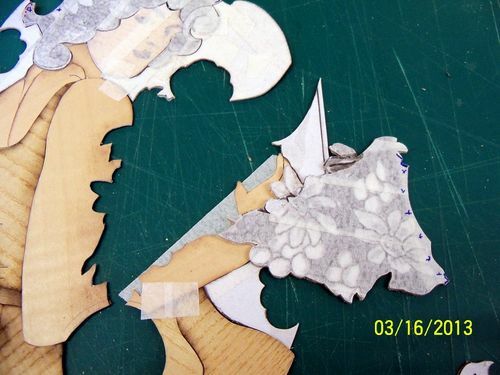 And an over-view showing how the motif will interact when it’s cut into the main Marquetry design for the wine box. Now that Nouveau Gal is all dressed up … it’s time to tackle her bouquet! Here is where I’ll leave off for now, as you’ve had enough pictures to look at!! Dealing with the bouquet will be lots of fun … trust me!! Thanks for reading … or just looking at the pictures!! and sending me all those wonderful words of encouragement. Until next time, enjoy all the beautiful signs of spring!!! Fantastic work. So life like. Amazing ,,,, So glad I found this series as I really enjoy reading this and learning! Great work but that goes without saying. Once again… I am amazed beyond words at your patience in doing this delicate work. Looking so good Elaine. Your experience with veneer choice is really showing here. This will be a truly outstanding piece. I’ll be by in a couple of weeks to see it. I love the ash veneer choice! I know you struggled with the grain but I think you choose brilliantly. It soft and hard difference in the ash really make her shirt look alive. Keep up the great work, I am so enjoying watching you! The quilted ash really is perfect for the dress. It’s really hard to picture just how small these details are. You’re doing a fabulous job on this masterpiece and a super teaching job as well. Your instructions are so complete and easy to follow that making this would be “a piece of cake” for me . . . sure, right, if I had YOUR talent, not to mention a whole lot better eyesight and manual dexterity! A perfect veneer choice Elaine, and the shading came out really well too. As they say, “The devil is in the details”, but your choices are more on the heavenly side. Maybe more fun work for you than your ‘Grapes of Wrath’. This motif will make a wonderful gift for your granddaughter. you still cling to my blog :). The next one should be up sooner than later … I hope!